Little is certain about the early history of Ross friary. A reasonable guess is that it was founded in 1498 for the Observants. Protected by the Clanricarde family, the friars were able to remain on after the Suppression despite several plunderings. In 1616 there was a community of six priests and two brothers in the old building. An unusual incident occured during 1641, when the guardian saved the survivors of an English party of travellers who had been attacked by the Irish near Shrule. The Cromwellian period meant some time in hiding for the friars. 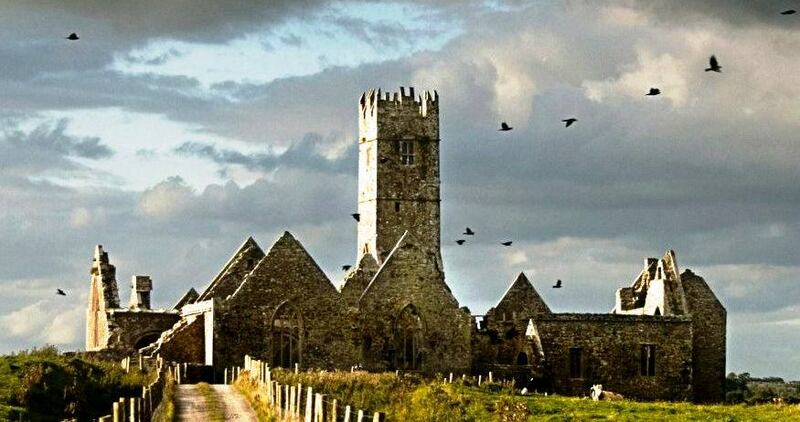 The friary was sacked in 1656. The friars had returned by 1661 and did not leave again until the attempted general expulsion of religious in 1697. They had come back again by 1711, when their protector was Lord St. George. At some stage they had withdrawn to Friars Island, but now, through the generosity of a Mr. Lynch, the friars were able to build a new home for themelves at the foot of Kilroe Hill. There was a community of seven living at Kilroe in 1766, but this had fallen to three by 1801. There were still three friars in the community when the friary was closed by order of the Provincial in 1832. The site is in a bog about a mile west of the village of Headford. Remains: the church, tower, chapels and friary are almost complete; there is evidence for large-scale alterations in the eighteenth century.